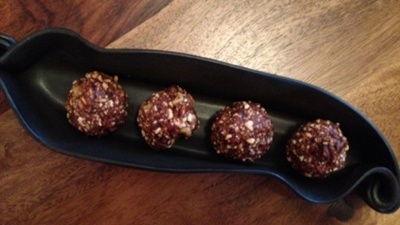 These delicious cocoa balls are a perfect healthy snack! Cocoa is the highest whole food source of magnesium, while cashews are loaded with minerals—copper, magnesium, zinc and manganese. This recipe is very easy to make for you and your family. And they are virtuous (and addictive in a good way). Add cashews and coconut into the food processor and combine until the texture is crumbly. Add cocoa, pomegranate, walnuts, coconut oil and rice syrup. Blend the above in a bowl, using a metal spoon to evenly combine the coconut oil and syrup together with the dry ingredients. Roll mixture into bite-size balls. Keep in the refrigerator for about 30 minutes, or store in a closed container for a couple of days prior to eating. Sandra MacDonald is a Toronto-area sales expert who is passionate about clean eating and experimenting with quality, natural ingredients. Her blog, Pure Food Creations, talks about her food inspirations and the amazing recipes she’s created.